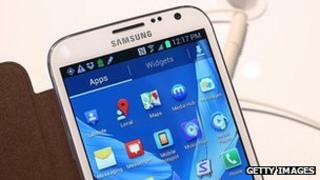 Global sales of mobile phones fell in 2012 compared with the previous year, according to a report from research company Gartner. It said 1.75 billion handsets had been bought, marking a 1.7% decline. Analysts at the firm suggested "tough economic conditions" had been partly responsible for the drop. It follows official data from Spain indicating its number of mobile telephone and datacard subscriptions fell by 5% over the same period. A report by the Spanish regulator CMT said there were nearly 2.8 million fewer such contracts at the end of the year than at the beginning, with Telefonica's Movistar unit and Vodafone bearing the brunt of losses in December. The country's gross domestic product (GDP) shrank by 1.3% in 2012, according to its central bank. Gartner's data suggests weakening demand for feature phones - lower-end devices with limited functionality - led to the drop. It said that in the final three months of the year, 264.4 million such devices had been sold - 19.3% fewer than over the same period in 2011. Although smartphones had seen a 38.3% year-on-year gain over the fourth quarter, they had still remained in the minority with 207.7 million units sold, the study said. The firm added that Apple and Samsung had dominated the smartphone market, with a combined 52% share in the October-to-December quarter. "There is no manufacturer that can firmly lay claim to the number three spot," said the company's principal research analyst Anshul Gupta. "Their direct competitors, including those with comparable products, struggle to achieve the same brand appreciation among consumers." He added that the overall fall in sales marked the first time the market had contracted since 2009. Gartner's data also indicated that in the fourth quarter, Android had powered 69.7% of all smartphones sold, while iOS had accounted for 20.9% of devices. For the year, that marked a gain in share for Google's operating system, but a decline for Apple's - although in terms of units sold, both firms made gains.